I was watching television at around 2:15 a.m. when I heard very loud banging at our front door. I rushed to my parents’ bedroom to wake them up but they were already awake. My father looked out the window to see who it was and he saw two Israeli soldiers. When my father openened the front door six soldiers entered our home. The commander told me and my brother and father to sit in the living room and he asked me for my name. Then he told me to fetch my telephone and my identity card and I did. The commander put my telephone in his pocket and then looked at my ID and compared my details with a list he had. Then he told me to get dressed as I was under arrest. When I asked him for the reason he told me I would soon find out at the police station. He gave my parents a document which he filled out in Hebrew. When I went to my bedroom to get dressed a soldier followed me and searched my clothes. My father told the commander he wanted to accompany me to the police station but the commander refused. I was then taken outside where I was tied with my hands to the front with two plastic ties connected to each other. The ties were not painful. I was also blindfolded. I was then taken to the back of a jeep where I was thrown on the metal floor. I had a cold at the time and when I tried to reach out for a tissue in my pocket a soldier kicked me on the leg. The jeep drove to a military base which I did not recognise and I was taken to a shipping container. I sat on a chair but I could not sleep because there was a loud noise of an engine which kept me awake. I asked to use the toilet and an hour later I was allowed to go to the toilet. A soldier cut off the ties and when I came back he tied me again, this time the ties were painful and left a mark on my wrists. 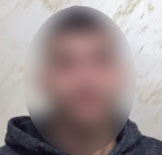 I was left in the shipping container until around 8:00 a.m. and then I was taken in a vehicle to the police station in the settlement of Modiin Illit. On arrival at the settlement I was taken to a room for interrogation. The interrogator removed the blindfold but kept me tied. He spoke good Arabic and wore a police uniform. He asked me for my name and whether I worked or was still at school. He had a voice recorder on. The interrogator showed me a photograph of clashes with soldiers and accused me of taking part. I denied the accusation. Then he pointed to a boy in the photograph and told me it was me. I denied it was me. Then he told me he was going to take the photograph to a lab for analysis to determine whether the boy seen throwing stone in the photograph was me or not. Half-way through the interrogation he showed me a document written in Arabic about my right to choose a lawyer and my right to remain silent. Then he asked me whether I needed a lawyer and then phoned one and left the room and allowed me to speak to him. The lawyer told me to say I was in a peaceful demonstration if the interrogator showed me photographs. I was suspicious of the lawyer because I felt he had consulted with the interrogator in advance based on what he said. The interrogation lasted for about two hours. 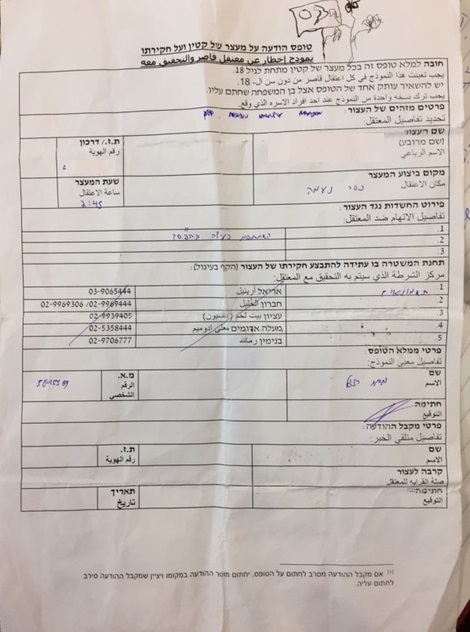 In the end the interrogator showed me documents in Hebrew and asked me to sign them but I refused to sign because I did not understand what was written. Then they took my fingerprints and photograph aswell as a DNA sample from my mouth. Then I was taken to Ofer prison. I arrived at Ofer at around 11:30 a.m. I was strip searched and then taken to Section 19. Two days later I was taken to Ofer military court. My uncle was there and the hearing was adjourned. On 26 November 2018 I was taken to the waiting room outside the court but I was never taken into court. At around 5:00 p.m. I was taken back to prison where I was told I was going to be released on bail. I was released from prison later that day and I arrived home after midnight. I found out that my parents had to pay 2,000 shekels bail but no one told me anything about another military court hearing. I also found out that my father tried to call the numbers on the document he was given when I was arrested many times but there was no answer. He wanted to know how I was but nobody picked up the telephone. I also realised that the police station I was taken to for interrogation was not listed on the document given to my father.